She is hot, single but not searching. 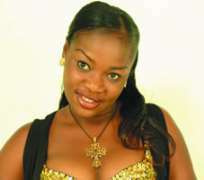 Right now, up coming Afro hip hop crooner Taiwo Elizabeth Olapeju aka Easy Lizy wants to concentrate on her music career. She has concluded arrangements for the release of her debut album entitled, Morning Dew. And you can bet, its gonna to be a smash hit. Born and bred in Lagos, Lizy, who studied Public Administration in Yaba College of Technology (YABATECH) and also Political Science in University of Lagos, started music professionally in August 2006. Perhaps, that's the reason Lizy has decided to counsel girls about relationships in her yet to be released album. One of the tracks entitled Soji Ara E is a clarion call to girls to “wake up” when they are in a relationship. “Girls should be careful of men who are out to use and dump them. They should 'wake up and shine their eyes' because there are many unserious guys around,” she admonishes. Single but not searching, the only girl from a family of seven, however, says when she is ready to marry, she would look beyond physical appearance in a man. “I like a mature, kind-hearted, trust worthy and understanding man. I don't want a man that would give me problems. In fact, I want a guy I can take home to mama. But then God's time is the best. Lizy featured fuji star Wasiu Alabi Pasuma in her seven-track album, which parades songs like If Not For You Baba, Bear The Loss, Oshomo, Apojuwon Lo, Soji Ara E and Show Me, among others. Lizy, who has performed at concerts as well as models for adverts, disclosed that her target audience is the young and old while she derives inspiration from God and her environment.